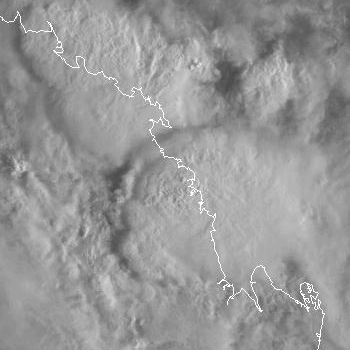 So anyway an intense monsoon low is making it's way south from central Queensland and is expected to hit areas north of Brisbane tonight bringing destructive winds and very heavy rain, of course the Bureau are issuing warnings for the Southeast Coast residents to brace themselves, so discuss the situation here. The low passed out to sea too quickly to have any affect at my location, and it dawned clear this morning only to have more rain this evening. But I must say I am not impressed with how the media blew up this event to the point I was getting concerned, they blew this event to such an extend I think they should be ashamed, not happy Jan! Some amazing falls around the Mackay area in the past 24 hours but particularly this morning with many places receiving 100mm/hr over a few hours. For people in the Central coast, Whitsundays. 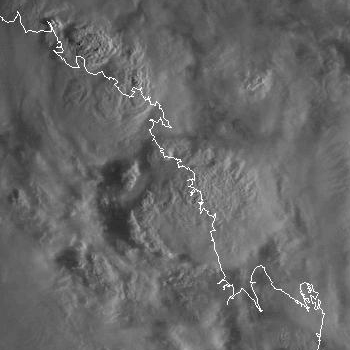 in the past 3 hours which will cause widespread flash flooding around Mackay. The rain is contracting slowly south and may begin to affect the area south to Sarina. is generating this torrential rain. Yes, with the TV news tonight reporting 600mm in 6 hours I reckon it must have been coming down. Not that you can always believe what you see on Channel 9! The radar for Mackay during the morning of 15th Feb is interesting so I've done up a loop - amazing how an intense echo can sit in one place for hours. Some of the weather reports and rainfall figures coming from Mackay and environs are amazing. Falls of up to 638 mm at a locality just east of the city. Other parts of the city had 625 mm. 625 mm fell in 24 hours. That is 26 mm per hour sustained for 24 hours till 9 am Friday. On top of that, 238 mm had fallen this month prior to this deluge taking the total to more than 850 mm for the city. The last time this happened was 1918 when 627 mm fell in one go. This is truly one amazing rain event. Additionally this whole region has had a soaking and places as far south as Yeppoon had until recently, falls of 479 mm or more so far this month. Rivers are in flood and there is a concern that crocodiles could be swimming in flood waters and flood affected areas. If you stare at that radar carefully you can detect rotation in the rain bands especially towards the end of the event which is followed by the rain area spreading away. I think it's likely that a low pressure developed right over the city. Any thoughts from anyone else? I did note the region of vorticity near the radar - thought I was seeing things. I would not personally suggest beyond reasonable doubt it was a low pressure but it does catch the eye and demand further investigation. Were the high totals centred on Mackay itself and within its vicinity? 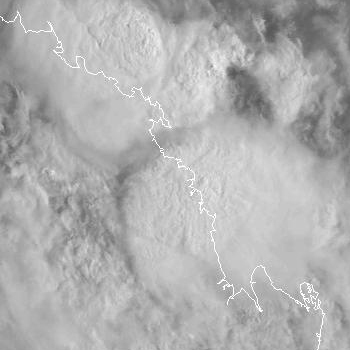 The high totals were just on and quite close to Mackay only and 500mm in 4 hours in Mackay itself is extraordinary ! The monsoon trough is not a simple east/west line - in fact on the surface, it is clearly to the north of Townsville, and has been since midnight - as you can see from the surface SE winds and lowest sfc pressures. The difference is aloft, the trough is tilted in the vertical, as it has to be to produce the kind of intense, prolonged rainfall about the Mackay area. A vertically tilted trough is the only way to get strong warm air advection in the low levels, which is where the persistent up-motion comes from. 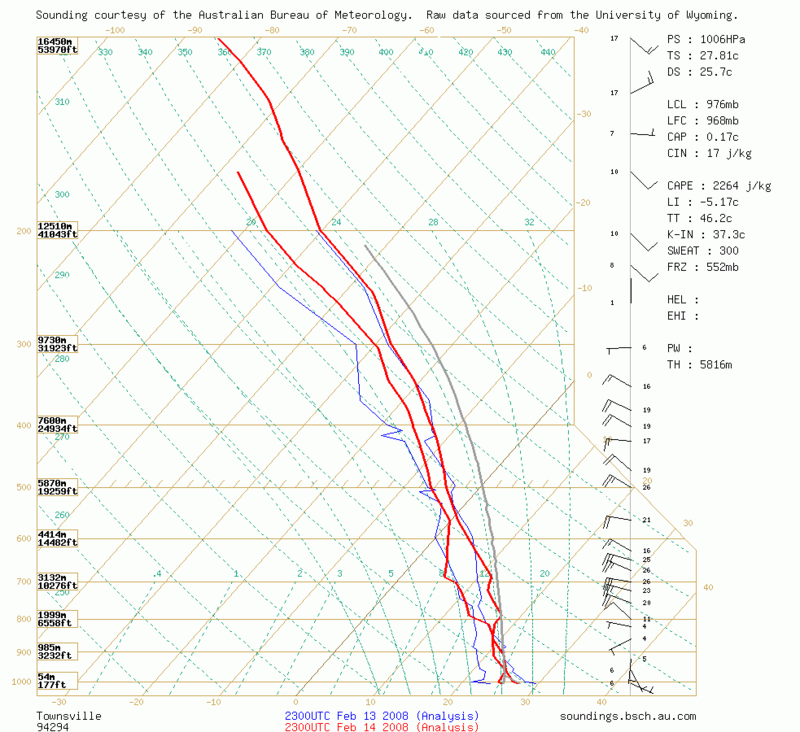 This is manifested in the wind profile - strongly backing from the surface through 700 hPa to 500 hPa at Mackay, but completely different at Townsville. Thanks to geosotrophic balance (or close to it) the backing profile always indicates warm advection in the Southern Hemisphere (except near the surface where friction complicates things). You will always see this wind profile with the high-end rain events. 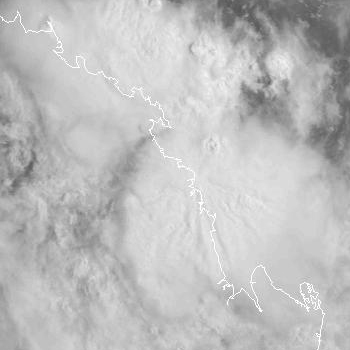 Of course, you also need the moisture and instability, but this is not usually a problem in N Qld in the wet season. Given the region itself is quite flat (I assume), it would take strong persistent convergence along a trough similar to other extreme events in the past. Namely, the event last year near the Gold Coast, extreme events near Wollongong involved persistent lines of activity training over the region. But the latter abovee-mentioned events also combined orographic effects to aid uplift. 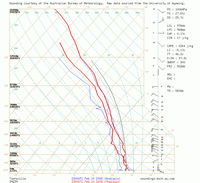 This event in Mackay is almost purely dynamical. Yes extraordinary. While Mackay itself is quite flat, the hills of the Great Dividing Range start about 20km west rising to 3-400m, and further inland up to around 850m. So if an onshore windstream was feeding the moisture towards Mackay at a low level it is feasible it could get stopped by the Ranges. However rainfall did extend inland though not as heavy as on the coast so this doesn't explain everything. For the Gold Coast event - you might be referring to the 30th June 2005 - though it does seem like last year ! Convergence and an unstable atmosphere also led to the 300mm in a few hours over the Tweed Kyogle areas for the flood on 4-5 Jan this year. Perhaps wrong location? Wasn't there an extreme event last year Gold Coast or Sunshine Coast? 700+mm of rain occurred from memory and filled the dams in the area whereas Brisbane continued into drought and water restrictions. The Gold Coast June 2005 is certainly another example.